The Fran Carlton Center, 11 North Forrest Ave in Apopka, FL. For more information and cost call Nancy at 407 464 6724. Come and visit the first class to see if you like it. We will be working all summer and it is an open class so if you miss a class ..no problem. And then we all go out to lunch. 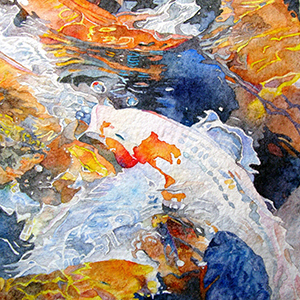 Basic Watercolor: Finish a painting in single, 2-hour class each month for only $25. See my schedule for a list of all my classes with locations and pictures. 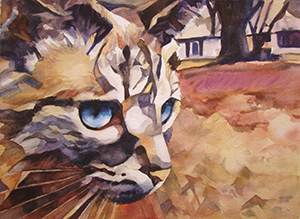 CFWS Roberta Lerman’s Watercolor Class has openings on Wednesdays from 1:00 to 3:30. The classes are ongoing and not divided into sessions. Classes offered at the Maitland Senior Center on Maitland Avenue. The class fee is $5 per lesson. Option: Pay $16 on the first Wed. of the month for the current and next three Wednesday sessions. The atmosphere is relaxed , attendees are expected to make good use of their time painting or drawing. • Members of the class may work on their own version of the demo painting or work on their own subject for remaining time. Instructor available to answer questions and assist for the remainder of the class. *Students responsible for their own painting supplies. The president, Mary Dall, thanked the University Club WP, and in particular Nita Rizzo and Daphne Frutchey for hosting the CFWS Charter Member’s Art Show which was a celebration of the folks who had the foresight to form our society. The membership table was manned in 15 min increments by volunteers so that any member wishing to renew for the 2016-2017 season had easier access. Several new memberships were added also. The president reminded all that the membership book for each new season is printed over the summer so all are encouraged to renew ASAP. A reminder was added: there is one more newsletter for this season, THEN, watch for the first newsletter of the new season in August where you will be able to see the calendar for 2016-17. Mary encouraged everyone to paint over the summer and be ready for the September fun “Show ‘n Tell” meeting where we all bring in paintings and share technique, inspiration and receive positive feedback. She thanked Nancy Larkin, Janet Asbury, Michel Oliver and her husband, Dan, who assisted in pick up of some of the painting from SOBO on April 2 and getting them to their owners. Our juried show folks, Jackii Molsick and Sandi Hanlon-Breuer did a great job. Thank you to Cindy Sturla, Nancy Larkin, Bob and Ann Hague, Ken Austin, Teresa Chin who are helping to review the by-laws. We are still looking for a plein air coordinator. Teresa Chin has it organized well and we hope someone will come forward soon. Mary added–we will be having lots of exciting demos and at least two workshops next season: Lynn Ferris and Jaime Cardero will be coming. Please consider attending at least one of these. Mary thanked Sharon Stitely who will be stepping down as Hospitality. She was recognized for her dedication to CFWS. Welcome was offered to Marge Reed who will be assuming that position. Marge recently made drapes for us to control the glare to the TV from the back windows at the G-M building. And, a thank you was sent out to Denise Hendrickson for her work with Publicity as she steps down and Judi Kaye steps up to assume that position. Thank you Sharon and Denise! Welcome Judi and Marge! The president turned back to the Charter Show. She gave a very brief history of how it all came about back in 1998. She named each Charter Member in turn and each received a round of applause as they stood or waved to the assembly. It was pointed out that while all charter members couldn’t be present, information on all was available on bio boards peppered amongst the high top tables. Lastly, a special thanks went out to Nita, Daphne, and Teresa Chin (all around best VP in the business) who helped to hang the paintings on Wednesday. Jerry Snyder, treasurer, was especially recognized for organizing the refreshments and settings for the show—and a thank you to everyone assisting. A special thanks to “the Michel and Ted show” who added greatly to the festivities. The lovely watercolor nametags were designed and made by Jackii Molsick. Lastly, Marianna Ross was recognized. She inspired and encouraged us to have this show to honor the Charter Members. The president then encourage everyone to mingle and have a good time reminded those assembled that we’d all be together again in the fall! Volunteer opportunities are available. Hospitality volunteer is needed now. May 1 is the Charter Member Show at the University Club, WP. This will be our last meeting for the 2015-2016 season. We want a good showing. Please come out aqnd show your support on May 1 at the reception from 2-4. Orlando Arts Magazine will have an Eye on Arts about the upcoming Charter Show. Interested in Tee Shirts and/or Aprons? Please sign up to show your interest. No money now. If we have enough interest we’ll order them in Sept. and know the exact cost as it may go down with quantity. Special thanks to Nancy Larkin, Sandi Hanlon-Breuer and Janet Asbury for assisting with pick-up and delivery of paintings from the SOBO Gallery. Thank yous went out for Plein Air at Yalaha in March hosted by Jackii Molsic. In April we will have TWO plein air opportunities‚ serving both sides of town. Members were reminded to renew memberships for next season 2016-2017 early, preferably today or on-line or via check to the treasurer as our May meeting will be at the University Club celebrating our Charter Members. Vlad Yeliseyev was introduced and did a wonderful demo. See you next month at the Charter Member Show opening. Thank you to Ricki McCurdy for setting up the sound for Dave Williams. Thank you to Rich Lewis and Dan for getting the equipment from the storage area and setting up. We would like to have a CFWS member step up to assist with set-up in the future. SOBO pick-up: Pick-up is April 2 between the hours of 3:30-5:00. If you are picking up your own art, that’s great. IF you want your art picked up and returned to A & H, please sign the clipboard or contact marydall to have your name added for pickup and delivery. Time to pick up paintings will be confirmed and in newsletter. Directions: Address in newsletter. GPS suggested. May 1 is the Charter Member Show at the University Club, WP. Reception 2:00-4:00. Clipboards for donations of food and/or wine were circulated at the meeting. This will be our last meeting for the 2015-2016 season. We want a good showing. A very brief business meeting and artist introduction will start at 2 with a reception to follow. A donation of food and wine clipboard was sent around. Jerry Snyder will assist with the reception refreshments. VP Teresa Chin (program chair and VP) introduced Nancy Larkin who coordinated this presentation on “Ways to Expand Your Art” publishing presentation with Q & A. This program helped to show additional ways to use our art. I know the members gained insight into putting art into book form. The roundtable with Edna Siniff, Amanda Egan, Nancy Larkin and yours truly was well received. Edna was a wealth of information. Her book, Living Seminole, is a fascinating history illustrated by Nancy. Nancy, as MC, delighted us with the art she created for (very young author) Amanda’s book, Dolly’s Garden. Amanda described how a loving memory turned into a book. Such a delight! And it was an added pleasure to have “Dolly” Ernestine Egan present along with Amanda’s dutifully proud Dad. Mary Dall and Roberta Lerman have both published using createspace and were part of the last segment on self-publishing. We apologize that there is no recap available. The president welcomed new members and guests. The president reminded everyone that the Make a Splash! 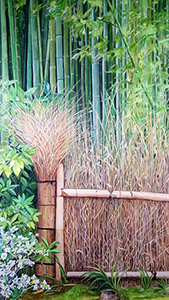 non-juried show at the Casselberry Art House was a success and runs until Feb. 5. She introduced and congratulated David Williams for winning the Peoples’ Choice for his painting, Lizard. She reminded everyone that pick-up at the Art House is Feb. 8-9. See you all at SOBO hopefully. The reception will be this Thursday, Feb. 4 from 5:30-8:00 Members were encouraged to come out to the restaurants, etc. and make an evening of it. Jackii and Sandi stood and were acknowledge for putting together such a beautiful show. Artists were reminded to please bring a bottle of wine. Bartender has been hired. The Art Book was mentioned for selling and swapping. Let’s use it! Job descriptions began posting in the Newsletter (one each month) and will soon be on-line. We want you to be thinking of the new board that will be for 2017-2018. We hope for a smooth transition in May of 2017. Plein Air at the Mayflower hosted by Sally Hall was fabulous! 12 artists in attendance. 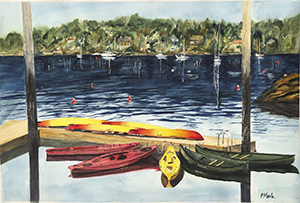 The Feb. plein air will be Feb. 20 at Lake Lily. 10:00. Next month we will be sending around a sign-up for help with the refreshments for the Charter Member show. The show is May 1 at the University Club and lots of info will be in the newsletter. Janet King, demo artist judge for the SOBO show presented a wonderful demo. 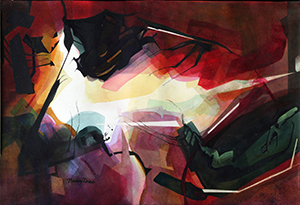 Several more members immediately signed up for the workshop which runs Feb. 1, 2, and 3 at G-M.
We welcomed everyone to the 10th Annual Central Florida Watercolor Society Member In House Show and Holiday party, in the Germaine Marvel building, at the Art & History Museums – Maitland. Members signed in and those with paintings had them numbered and displayed for the voting. Also, one free raffle ticket was given to each member. Mini paintings were displayed and as we ate our meal those who brought one took one out of a small box. We thanked our volunteers and hospitality chair, Sharon Stitely. After guests were introduced we had a quick business meeting making a few announcement of upcoming events. Dec. 12 – SOBO jpgs are due to Jane Brinckerhoff. 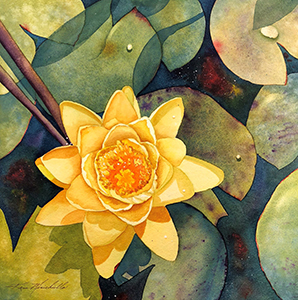 Jan. 4 – Drop off for CFWS Non-Juried show ‚ “Make a Splash” at the CASSELBERRY ART HOUSE. Contact Mary Dall, Rita Watts or Jerry Snyder with any questions. Jan. 31 – Janet King demo. at regular members meeting ‚ 1:30 – Germaine-Marvel building. 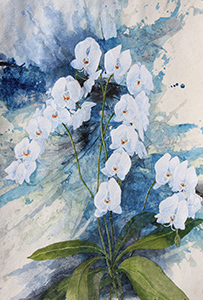 Feb. 1-2-3 – Janet King Workshop, Germaine Marvel building, Art & History Museums‚ Maitland. Use the ONE TIME coupon and get signed up. Only 1/2 down holds your spot. We are opening the workshop to non-members, but they are NOT eligible to use the $50 coupon. 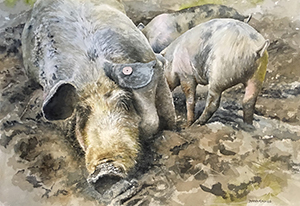 March 6th ‚ CFWS member meeting‚ Nancy Larkin will be presenting a program from an illustrator point of view. Nancy also spoke about her Mennello workshop on Dec. 15. Sally Hall, stood up to speak about the next Plein Air event on January 16 at the Mayflower Retirement Community, behind Crealde. She is hosting this event and described the lovely scenery there to paint and draw, and how to get there. After the business was taken care of, we passed out ballots for the people‚ choice voting and the meal was begun. There were four tables filled with amazing appetizers, food, desserts, and drinks. It was all so delicious! We ate far too much! As the meal was winding down, we began the raffle for donations from Art Systems, Fogo de Chao, Blick art materials, Kim Minichiello, Tom Jones, Laura Evans/Studio 17, Dana Daydodge and the estates of Dee Jansen and Connie Marcan. We had the one and only SANTA (Michel Olivier) help to hand out the prizes! Dave Williams did the raffle calls in a most entertaining way! What great fun we had and we laughed until we cried!